Let’s face it. Building a company at all is hard. You juggle so many different things during a single work day that at the end you are beyond exhausted. Now try to do everything while also being environmentally conscious. (because let’s face it, it’s been one of the most prevalent business trends of the last decade). Are you asking how can I possibly do this? Well we don’t have all the answers but we have some tips to at least set you in the direction of being friendly to your environment. Yes, you can insert a shameless plug sigh here, but really software can help. There are plenty software and apps that can help cut your paper waste. Everything is done on the office computer and then sent to the field electronically. Stop printing techs schedules, notes for the field, invoices, etc. Most field service software also allow you to set reminders to pop up, so you can get rid of those pesky post-it notes covering your desk and computer screen. Added bonus? They make your business more profitable, efficient, and effective. If history has shown us anything it’s that technology helps humankind overcome obstacles. Provide your techs with GPS systems. Either install GPS systems in your trucks or have your guys use the ones on their devices (with caution, of course). By routing efficiently, you ensure your techs are not driving from point A to point B then back up by point A for an appointment at point C. This greatly cuts down on your company’s personal fuel pollution. The GPS system directs your guys where they need to go. Getting lost can waste a lot of gas, not to mention money with these recent gas prices. Routing efficiently and providing tools to ensure your guys show up on time can lessen your negative effects on the environment. Check out this site. They have everything from coffee cups to toilet paper. . Replace your cleaning supplies with natural cleaners as well. Not only is this another check off your “being green” list, most of these are cheaper than products you buy in stores. 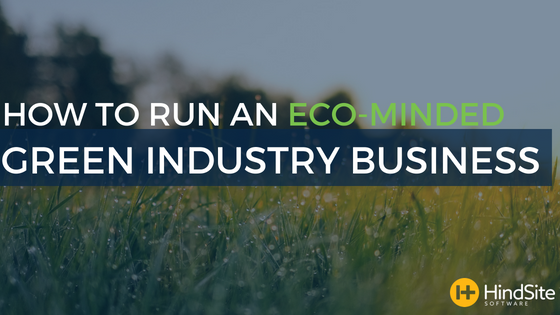 If none of these motivate you to build your business in to an environmentally friendly business, perhaps potential customers will. That’s right. There are prospective customers out there actually searching for companies who are “green”. By announcing yourself as a “green business” and offering services - like water conservation - you can catch the eye (and money) of these prospects. We know that not all of these will work for everyone, but if you can use even just one tip (or find your own) you can lower your impact on the environment. Give it a shot! It won’t hurt and in fact it may even help in the long run.